I suggest reading Part 1 for background and context, if you haven’t already. A particular and distinctive looking type of extensive scaling (large contiguous areas with bark removed) with associated insect tunnels on bitternut and pignut hickory boles – live trees, snags, and stubs – may be diagnostic for ivorybill. For recent work, the presence of large bark chips at the base of such trees is a related potential diagnostic. Insect tunnels are present on this stub. Species is/are unknown, and tunnels are small compared to those found in the hickories. In contrast to the hickory discussed in the previous post, there were no woodpecker captures over the course of this deployment and squirrels were very active on the scaled area, appearing on May 4, 5, 8, 10, 12, 13, 15, 17, and 22. There were multiple visits on some days, and the total time spent on the scaled area was significant, upwards of an hour, with at least one visit lasting nearly 25 minutes. It was surprising that squirrel activity ended on the scaled area ended on May 22nd, and there was none over the next 11 days. This suggests that squirrels are unlikely candidates for removing bark from hickory boles in quantity, leaving large chips behind, or initiating extensive scaling on hickories. In my view, it’s probably impossible for them to do so. The results for Pileated Woodpecker from the hickory deployment and squirrel from this one support my hypothesis that Ivory-billed Woodpeckers are the source of the initial hickory scaling. But more data are needed. Before turning to the trail cam captures and accompanying images of the scaled surfaces, I’ll provide some background information on the impetus for this post and on squirrel behavior. At first, I took some umbrage at this suggestion, thinking that I had thoroughly examined and considered what squirrels might be doing on the hardwoods in our search area and what the upper limits of their capacities might be. While my basic views on this are unchanged, and the trail cam images tend to support those views, I’m grateful to Wylie for keeping me on my toes. It’s certainly true that in the past I have failed to consider squirrels and the role they might play in bark scaling, and this has led me down some blind alleys, as was discussed in a series of posts in early 2016. I have also been too confident in those conclusions, even though I think this material supports them. Wylie’s suggestion led me to conduct additional online research on squirrels (and he provided additional references). I had a number of off-the-cuff theoretical and observation-based objections to Wylie’s suggestion. One evolutionary objection is reflected in a comment I made early in our exchange: “the predator in question would have to have evolved to take advantage of this very narrow window of opportunity when the insects are near the surface . . .” I thought and still think this points toward a woodpecker as the source, and toward a Campephilus woodpecker in particular, since this foraging strategy is characteristic of the genus. 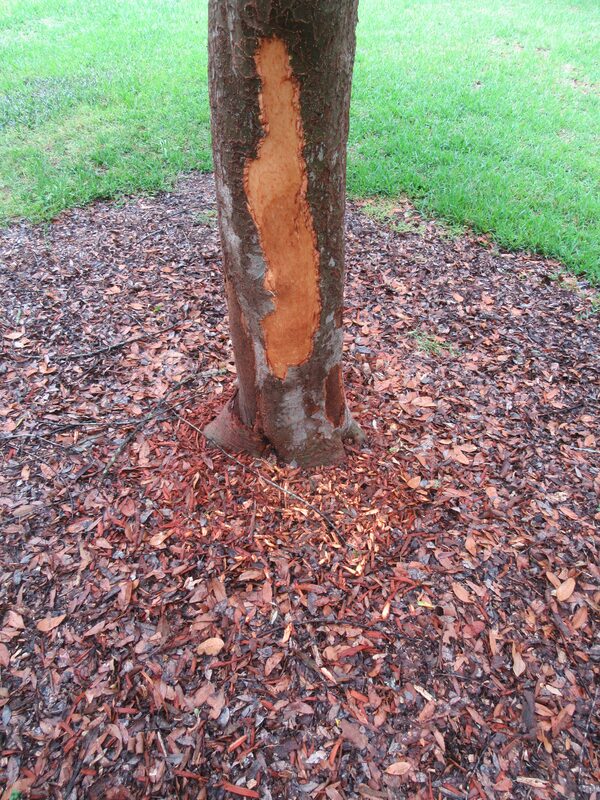 The hickory scaling is associated with sapwood dwelling Cerambycid infestation, and signs of woodpecker activity (targeted digging around exit tunnels) are present in all cases. The homepage tree was very recently scaled when found, and woodpecker evidence was present. Wylie replied that squirrels are opportunistic and might be feeding on larvae; he went on to suggest that woodpeckers following the squirrels and doing targeted digs around the exit tunnels was a possibility. Two of these pores have dead ends (with 1-mm depth), and the third is the germinal pore, which is deeper but is closed by a soft and easily penetrable tissue, located on the side opposite the fruit’s internal gibbosity. The internal gibbosity is a projection of the endocarp that inhibits the squirrel’s access to the endosperm when the fruit is opened from the side containing the dead-end pores. The squirrel must determine the position of the internal gibbosity to avoid it and thus save energy and time in obtaining the endosperm. These rodents are known to identify the side without the internal gibbosity even before beginning to open the fruit, with >90 percent success (Bordignon et al. 1996, Mendes & Candido-Jr 2014). However, how the squirrel identifies the side without the internal gibbosity remains unknown. As the gibbosity is always on the side opposite the germinal pore (Bordignon et al. 1996), this pore is an important access point that the squirrel can use to open the fruit efficiently. It is believed that the squirrel manipulates the fruit by pressing the three pores with its upper incisors, using the pore without a dead end for support so that the lower incisors can open the endocarp (Bordignon et al. 1996). Efficiency is one of the main factors that determine the foraging strategy of Sciuridae. A laboratory study conducted with the squirrels S. carolinensis and S. niger found that individuals preferred various species of nuts with low energetic value that lacked an endocarp or shell over high energy nuts with an endocarp (Smith & Follmer 1972). These results suggest that there is a high cost in energy expenditure for processing seeds with endocarps for these species. (Alves et al. “Queen palm fruit selection and foraging techniques of squirrels in the Atlantic Forest,” Biotropica 50(2): 274–281 2018). Efficiency is an important consideration in this context, especially with respect to hickories. The reasons squirrels strip bark are poorly understood. Pine (or red) squirrels attack a number of tree species, “[d]uring winter, spring, and early summer, bark stripping and tree girdling for consumption of phloem and cambial tissues is common (Hosley, 1928; Linzey and Linzey, 1971; Pike, 1934). Pine squirrels also eat the bark of rust galls (Salt and Roth, 1980) as well as sap from sugar maple trees (Acer saccharum) in the northeast (Hamilton, 1939; Hatt, 1929; Heinrich, 1992; Kilham, 1958; Klugh, 1927; Layne, 1954) and yellow birch (Betula alleghaniensis) in the Great Smoky Mountains (Linzey and Linzey, 1971). Widespread, systematic sugar tapping by pine squirrels occurs in New England (Heinrich, 1992).” (Steele, M. A. 1998. “Pine squirrel (Tamiasciurus hudsonicus),” Mammalian Species 586:1–9). There seems to be less agreement as to why Eastern gray and fox squirrels strip bark. It has been suggested that a calcium deficiency might be primary driver. C.P. Nichols et al., “A novel causal mechanism for grey squirrel bark stripping: The Calcium Hypothesis,” Forest Ecology and Management 367 (2016) 12–20. Bark stripping by Eastern gray and fox squirrels seems to be more prevalent in areas where the species have been introduced, “[b]ark-stripping behaviour, reported so often in Europe (Shuttleworth et al. 2015), is extremely rare in their native range (Kenward 1989).” (Koprowski et al. “Gray not grey: The ecology of Sciurus carolinensis in their native range in North America”, posted on Researchgate.com, 2016). While “extremely rare” is an overstatement, it does appear that bark stripping occurs more frequently in areas where gray and fox squirrels have been introduced. It is a major problem in the U.K and Europe but mostly an annoyance in the United States. It seems reasonable to infer that it is more common in suburban and residential areas than in mature bottomland hardwood forests, though Wylie points out that the discrepancy in the reporting may be due to demographic factors and that squirrel behavior in bottomland hardwood forests has been poorly studied. Gray and fox squirrel bark stripping seems to occur most frequently on branches, and I found no images in which insect infestation of the scaled areas was apparent. In addition, the examples of extensive squirrel scaling found online in no way resemble what we’re finding on hickories. Thus far, we have found only two references to squirrels stripping bark from trees in the genus Carya, one from pecans in Georgia and one from limbs in West Texas pecan orchards, where fox squirrels have been introduced. It’s not clear what parts of the trees were involved in Georgia and whether this report also came from an orchard, but regardless, pecan bark is flaky and not criss-crossed, making it easier to scale. While neither Wylie nor I conducted an exhaustive literature review, we found no records of gray or fox squirrels scaling bark from any bitternut or pignut hickories (Carya cordiformis and Carya glabra), be it on limbs or boles, in several Google searches. Given the extensive range of these species – most of the Eastern United States and into Canada – and the association between squirrels and oak-hickory habitats, if squirrel scaling of hickories occurred with any regularity within the natural ranges, one would expect references to be abundant in both the popular and scientific literature. As mentioned in the previous post and implied above, I suspect that the criss-cross pattern that characterizes pignut and bitternut hickory bark is one factor that deters squirrels from removing it and may prevent them from removing it in large pieces. This relates more generally to the question of efficiency. The characteristics of hickory bark make it extremely difficult for any creature to remove. In addition to the pattern of the grain, it is literally the hardest, strongest, thickest bark in the forest. On mature boles it can be 3/4″ thick (compared to around 1/16″ for a hickory endocarp). It is tight (though less so when sap is flowing), and it retains these characteristics long after death. Bitternut hickory bark does not flake, and pignut does so infrequently and superficially. As I see it, all of this militates against squirrels as the original source of the hickory scaling. While this is inferential and we have yet to document whatever initiates the scaling, the data obtained thus far support the inference. Only recently have we been able to deploy enough trail cameras for a meaningful and sustained effort. Nevertheless, we have had many hours of captures since 2009, in both search areas. To my knowledge, the only prior unambiguous capture of squirrel scaling is the one from 2015; it involved a downed, immature sweet gum with thin bark, which was easy for squirrels to scale. A second clip may show a squirrel removing a very modest quantity of thin bark from a sweet gum limb that was already being scaled by Pileated Woodpeckers (second video clip at end of post), and Wylie observed a squirrel scaling a sweet gum branch (on a roadside just outside the main search area) in December 2015. I no longer think scaling on sweet gum limbs (so heavily emphasized in Tanner) is a strong indicator of ivorybill presence, at least not on its own, although what we’ve found in the search area seems to be unusual. Abundance, lack of correlation with low mast years, bark chips, absence of incisor marks, and indications of woodpecker activity, especially targeted digging, may all be suggestive. Sweet gums, which are very attractive to beavers, are likely one of the most desirable targets for squirrels as well, for reasons of flavor and efficiency. But we have documented no squirrel scaling on hickories, live or dead, on limbs or on boles, partially scaled or with bark intact. I think the results from this deployment shed considerable light on the issue of squirrels and bark scaling, especially what they do (or can do?) on a mature bole with thick bark. So let’s go to the videotape, as a New York sportscaster used to yell. As with the previous post, our Plotwatcher Pro trail cam is programmed to capture one image every twenty seconds, and these time-lapse sequences have been converted into QuickTime movie format. If you want to get a clearer sense of how the squirrels are behaving, you can step through the films frame-by-frame. If you elect to watch just one of the clips, the one from May 8 that starts at Frame 1500 (the squirrel spent 24 minutes on the scaled surface) or the one from May 12 that starts at Frame 1574 might be your best bets. Discussion and close-ups of the scaled surface follows the bonus imagery. While we had no woodpecker detections on the stub and bird captures were few, we did catch some hogs (piglets?) and a beaver. Also captured but not shown were a Northern Cardinal and an Eastern Phoebe. As best I can tell, the only expansion of the scaled area involved a narrow strip at the upper right, probably no more than 12″ x 2″, and a little widening at the very top, although this was an area where the squirrels spent a considerable amount of time. Let’s look at some details from that scaled area. While there appears to have been some woodpecker excavation at the middle left of the larger scaled patch, there’s no readily apparent sign that woodpeckers have been after the insects that are feeding in the sapwood. Nor is there any strong indication that squirrels were feeding on insects over the course of this deployment, though it’s possible they took advantage of snails and beetles, like the ones in the photo, or slugs, which I also saw on the scaled patch. The edges of the bark shown in the close-ups, especially the one at the top, show signs of having been gnawed, although this is subtle, and sometimes impractical as an identifier, since such close examination is not always possible in the field. I presume that the abundant squiggly abrasions to the surface of the underlying wood are incisor marks, something we have not observed with other scaling we’ve found. With regard to what was left behind, the first three photos show what I found at the base of the snag when I discovered the scaling on May 1, 2018. The large, though narrow, strip of bark was the biggest one I found at the base and is one of the main reasons I suspect that woodpeckers initiated the scaling with squirrels following, although I would not rule squirrel out completely. In any event, the bark was so soft and weak that it broke in my hand when I picked it up on June 11. The other thin strips are more consistent with what I’d expect for squirrel, and the tiny orange pieces of cambium are a giveaway. The situation had changed little during this most recent trip. The picture with my boot shows the larger pieces of bark I found at the base, including the one shown above after it broke. They may be consistent with woodpecker (possibly including Red-bellied or Hairy), but I suspect that both squirrels and woodpeckers were involved in the bark removal. Edited to add: For any extensive squirrel work on mature boles, especially hickories, I would expect to find many small pieces of bark on the ground, similar to those shown above, as in this dramatic example. My main objective in targeting this stub was to observe it over time, more for what might happen as the decay advanced and whether it might become a target for ivorybills; it’s the type of “stump” that Pearson described as being favored by ivorybills after his visit to the Singer Tract in 1932, though Pearson’s “stump” (scroll down in the linked article) was much longer dead. The bark scaling, while interesting, was in the “could have been anything” category. Getting this data on squirrels was a pleasant surprise, one that I should have anticipated based on the small bits of cambium on the ground. My bias came into play, as I ascribed them to a smaller woodpecker. Between Wylie and the trail cam results, I’ve learned a lesson. In terms of the bigger picture, however, the results so far suggest that squirrels are not the source of the putative Ivory-billed Woodpecker scaling on hickories.